Conquest™ (BAC-9000) series controller-actuators are designed to operate VAV (Variable Air Volume) terminal units. The integrated alarming, scheduling, and trending enable these BACnet Advanced Application Controllers to be powerful edge devices for the modern smart building ecosystem. With integrated actuators, internal air pressure sensors, and other powerful features, they are ideal for new installations and retrofit of less-efficient equipment. The factory-supplied programming covers common VAV applications. The controllers feature simple, menu-driven setup choices using an STE-9000 series digital sensor, which can be installed permanently as the room sensor or used temporarily as a technician’s service tool. The Ethernet-enabled BAC-9001CE can also be configured by connecting an HTML5-compatible web browser to the built-in configuration web pages. 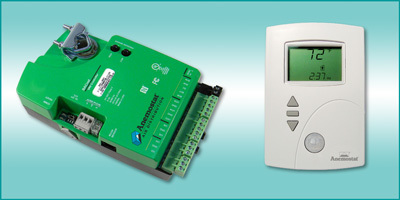 To meet the most demanding building automation custom requirements, these controllers are also fully programmable. Up to four sensors in a single package minimizes labor, wiring, and wall space, while optional humidity, motion, and CO2 sensors allow expanded energy-efficient control of humidity, temperature setback, lighting, and ventilation. A user-friendly three-button integrated operator interface provides system viewing and adjusting for occupants. It connects to a controller via a modular jack connection using standard Ethernet patch cables.